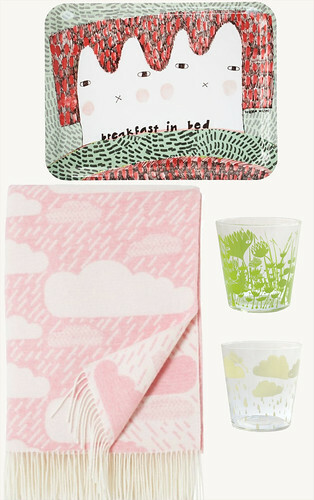 Melamine tray entitled “breakfast in bed”. Perfect for just that. Rainy day throw in pink. I would love to have this at the foot of my bed to pull over us on a chilly night or for cuddling under while watching a movie. Lovely screenprinted glasses. Speaking of breakfast in bed, this would look perfect with some orange juice in it. I’d love to put some stalks of lavendar and chamomile in this one. How pretty would purple and yellow look together through some graphic clouds?! Over the weekend we went to a birthday party at our friend’s house in Red Hook, Brooklyn. She made her own beautiful cake with pale pink frosting. I told her that she should create a baker’s portfolio to document her beautiful creations before we all devour them. Sunday, we hung with friends along the waterfront in Battery Park. We picnicked on chili, cornbread, orange salad and brownie bites….yum! Hope you had a tasty weekend too.